RentalDesk NX is a Windows based rental inventory management system containing all the features that a typical rental company needs for it's day-to-day operations. A maximum of 40 different types of equipment. A maximum of 100 customers. Printout templates can not be changed. The RentalDesk NX Startup package allows you to trial the software whilst using it in a real world situation. It will not time out after a trial period, you can simply use it for as long as you like. When you are ready to commit to using the software as a mission-critical business tool, you can simply purchase a license on-line, keeping your existing data or starting afresh - which ever suits you. This is a simple one off charge. No monthly fees to worry about. There are no extra modules required, everything is included in the one simple to use package. If you decide to buy within two weeks, then we'll give you a 20% discount as a thank you for trying our software. RentalDesk NX requires a PC running Windows XP, Vista, Windows 7, Windows 8, 8.1, 10 or Server 2003 or greater - 32 or 64 bit. The computer requires a minimum of 512MB RAM with a 1024x768 resolution display and 16 bit colour. RentalDesk NX uses the TCP/IP protocol to communicate with the RentalDesk NX Server. This protocol is installed by default with Windows. RentalDesk NX will help you to manage your business, recording and tracking all your rentals. With its straightforward user interface, RentalDesk NX simplifies the whole process of implementing a rental management system, getting you up and running quickly. The inbuilt tutorial will guide you through the program and you will have your first equipment list, quote & invoice printed and on your desk within 10 minutes. Powerful equipment lists editing allows you to build quotes quickly, incorporating sales & rental stock - and even free text lines. All the equipment availability is shown in real time, to allow you to choose the best equipment for the job, which leads to a great ROI for your stock. RentalDesk NX's easy to use inbuilt report designer lets you modify any paperwork, such as quotes, prep sheets, pull sheets, delivery notes or invoices to reflect your corporate identify and match existing stationary. RentalDesk NX requires a PC running Windows XP, Vista, Windows 7, Windows 8, 8.1, 10 or or Server 2003 or greater - 32 or 64 bit. Affordable, compact, powerful and easy to setup & use, RentalDesk NX is the perfect choice for the small production industry business enterprise. The ability to email smart, customisable quotes to customers within minutes of an enquiry. Allows you to quickly put together simple ot complex rental lists in an easy to organise, well laid out format. Keeps you informed of the precise availability of all stock items as you pick them for hire. Both stock items and freely typed text can be combined on hire lists. 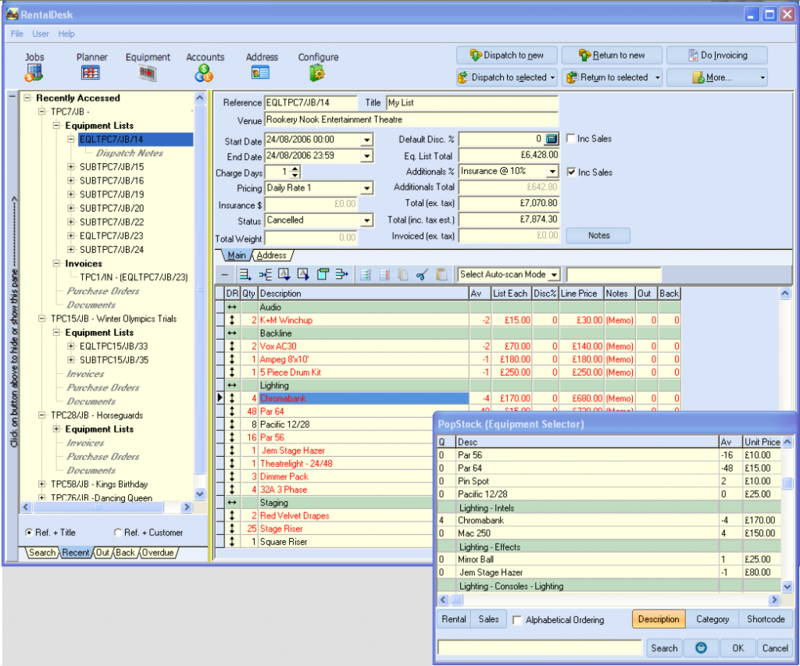 Simple to generate dispatch notes, invoices and purchase orders with just a few mouse clicks. Complete overviews of all equipment and accounting movements. Ability to record cash payments and deposits. 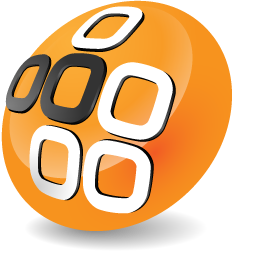 RentalDesk NX requires a PC running Windows XP, Vista, Windows 7, Windows 8 or 8.1, 10 or Server 2003 or greater - 32 or 64 bit. 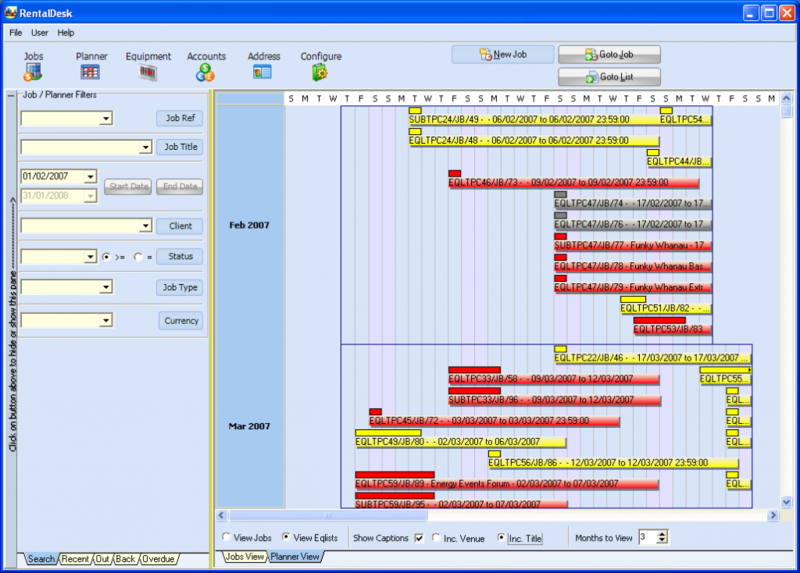 The Planner View gives an overview of the jobs in a calendar based format. Clicking on a job takes you directly to all the information about the job. The Job Book gives a clear view of all the jobs, with any equipment lists, invoices, dispatch notes and documents grouped together. The Equipment Planner allows you to quickly see where all your equipment is. With easy to use graphic interfaces you can manage your equipment to maximise revenue and minimise sub-rental costs. The Address Book contains the facilities you need in an integrated package. It includes tax and credit terms and the option of multiple addresses, such as invoice and delivery addresses, for the companies and individuals you trade with. RentalDesk NX has been designed to be flexible so that you control the program and not the other way round. RentalDesk NX contains a powerful report designer that allows you to customise any aspect of the paperwork produced by the program, or allows you to create your own new reports. The RentalDesk NX StartUp package allows you to trial the product while using it in a real world situation. It will not time out after any trial period and if you are able to work within its constraints then it's yours, free of charge, forever! The RentalDesk NX Commercial package allows you to run the application with 1 to 5 simultaneous users. Simply purchase the number of licenses you require. Additional users can be purchased at a later date, simply by paying the difference in price. The Enterprise version of RentalDesk NX adds an additional 5 user to an existing 5 user system. Capable of coping reliability and robustly when hit by a heavy work load, this version is designed for those larger organizations that prefer the RentalDesk NX feature set. All RentalDesk NX users have 90 days (from date of purchase) free technical support via the Navigator Systems technical support Help Desk and e-mail. If you also require telephone support, this can be provided for an additional payment. Both the Commercial and Enterprise versions of RentalDesk NX include a comprehensive report writer module, to allow the user to edit existing reports and design new ones. 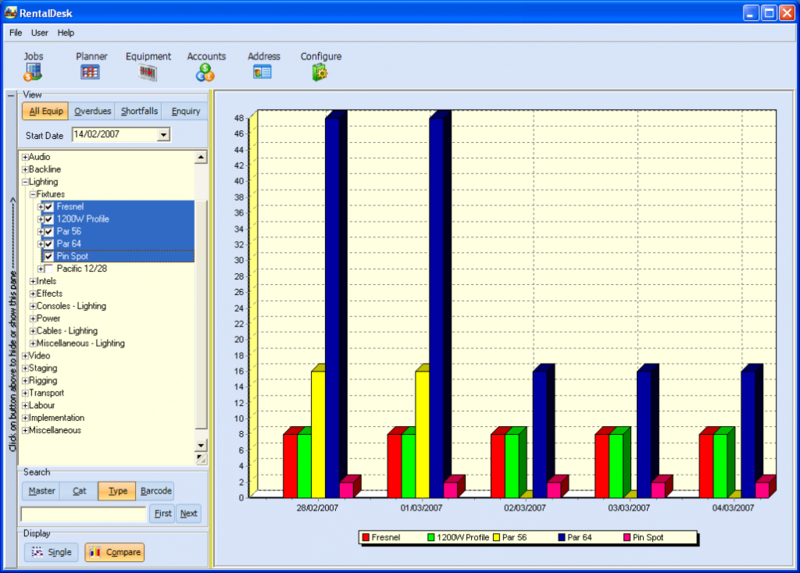 We can also provide a report writing service for those customers that desire a turnkey solution. On the odd occasion when we have needed immediate online support, it has been supplied very quickly meaning our downtime was kept below one hour. Even Microsoft couldn't compete with that. When you are ready to commit to using the rental management software as a mission-critical business tool, you can simply purchase a license on-line, keeping your existing data or starting afresh - which ever suits you.